The Goldkronach mining ducat 1855, Munich (Carl Friedrich Voigt) is based on the exploitation of the mines in Upper Franconia. 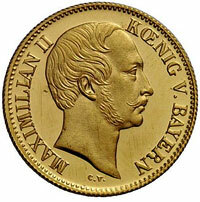 Obverse – Maximilian II – Koenig V. Bayern. Head right with engravers signature (C. V.) below truncation. Reeded edge. Divo/S. 32, F. 279, M?seler 4/6, Sch. 120, Jaeger 129. 3,61g. Cameo proof, mint state with tiny hairlines on obverse. Ex Gerhard Hirsch, Auction 119, 1st Feb 1980. The gold yield from the goldmines of Goldkronach (near Bayreuth) in Upper Franconia was very low during the 19th century, as most of the gold deposits had been exploited during the 14th and the 15th centuries. 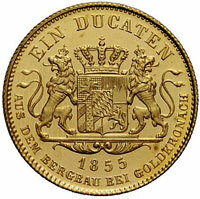 Few coins from that period have been struck and this Ducat belongs to the most valued coins of the 19th century. Maximilian was king of Bavaria from 1848 until 1864. He was the son of Ludwig I of Bavaria and Therese of Saxe-Hildburghausen. But as a king he was hampered by constant ill health, which often took him abroad often. While at home he was forced to live mostly in the countryside. He had two sons by his wife, Marie Friederike Franziska Hedwig, daughter of Prince William of Prussia, whom he married in 1842. His sons were Ludwig II of Bavaria and Otto of Bavaria, both of whom became king and then lost their reason. King Maximilian II. was the principal of the Maximilianstrasse and the Bavarian National Museum in Munich. He preferred a new architectural style with strong reference to the Gothic Revival architecture which would combine the best features of historical models combined with, what was then, modern building technology. The hiking path in Upper Bavaria called Maximiliansweg is named after him. King Max, as he was affectionately known, died on 10 March 1864 (aged 52) and is buried at Theatinerkirche, Munich.